In Allegiance, players use cards to adjust the influence of the Thieves’ Guild and Temple. At the end of the game, the organization with the most influence emerges to power. Players begin with an allegiance to the Temple. However, that allegiance can shift during the game as players accrue points that align them with either the Temple or the Thieves’ Guild. All players with allegiance to the Temple win if the Temple has the most influence. One player with allegiance to the Thieves’ Guild wins if the Thieves’ Guild has the most influence. 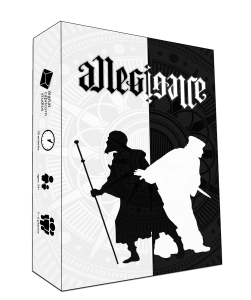 We have developed a workshop for Allegiance on Tabletop Simulator. You can access the workshop here.